contact Noelle by e-mail hafod.art@hotmail.com if you would like to take part. ~each artist can send up to six books, each book must be represented by one unwrapped copy for display and handling. You can post books to the artist organising the stand or deliver books to the fair. If you post books please only include 1 wrapped copy for each large book you display (ensure the display copy can also be sold) or 2 wrapped copies for small books. ~one artist is responsible for booking and organising the stand. All costs (stand, catalogue and organiser's travelling expenses) are shared by the artists exhibiting. ~Site artists are notified about forthcoming fairs with deadline dates to register their interest and information about where to deliver or post books etc. A non-refundable deposit is charged on confirmation of a place. ~a charge of £5 each will be added to the deposit to contribute towards the running of the website (or a charge of £10 for LINK artists). This charge will be made once a year - not for each fair. Artistsbooksonline.com represented five artists at 11th International Contemporary Artists' Book Fair, Leeds on 7 & 8 March 2008. Artistsbooksonline.com represented seven artists at LAB'07 (London Artists Book Fair) at ICA on 23-25 November 2007. Five artists were represented on the English Desk at the Tenth International Book Fair, Marseilles, France on 20-21 October 2007. Artistsbooksonline.com represented seven artists at the Bristol Artists Book Fair on 21 & 22 April 2007. Artistsbooksonline.com represented seven artists at 10th International Contemporary Artists' Book Fair, Leeds on 9 & 10 March 2007. Artistsbooksonline.com represented nine artists at the London Artists Book Fair (LAB'06), ICA, London in November 2006. Artistsbooksonline.com represented six artists at The First Manchester Contemporary Artist's Book Fair in September 2006. Artistsbooksonline.com represented seven artists at the 9th International Contemporary Artists' Book Fair, Halifax on 11 March 2006. 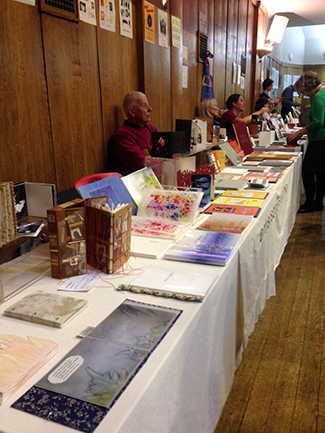 Artistsbooksonline.com represented six artists at the Small Publishers Fair 2005, London on 21 & 22 October 2005.